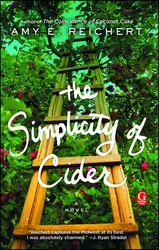 Focused and unassuming fifth generation cider-maker Sanna Lund has one desire: to live a simple, quiet life on her family’s apple orchard in Door County, Wisconsin. Although her business is struggling, Sanna remains fiercely devoted to the orchard, despite her brother’s attempts to convince their aging father to sell the land. As Sanna’s formerly simple life becomes increasingly complicated, she finds solace in unexpected places—friendship with young Sebastian and something more deliciously complex with Isaac—until an outside threat infiltrates the farm.